Boykin Spaniel Society Registered (BSS) Puppy. Ready for pick up 1/17/19. Born on Thanksgiving. Female. BSS Registered everything tested. "Tank"
BSS Registered. Family pet calm mama. Loves our kiddos. Overview: The Boykin Spaniel was developed in South Carolina for retrieving. This is the State Dog. The breed is good tempered and has few health issues. Coat: The coat is flat to moderately curly with medium length, fine hair with light feathering acceptable on the legs, feet, ears, chest and belly. A short, straight coat without feathering is acceptable. Character: Boykin Spaniels are well behaved, but must be socialized properly from a young age to be good pets. Temperament: Boykin Spaniels are good with other animals and with well behaved children. They must be socialized to get along with both kids and animals. Care: This breed should be brushed daily or at least every other day to keep the coat from matting. Training: Boykin Spaniels need some basic obedience training. Time should be taken to socialize them to children and other animals. Activity: Boykin Spaniels need plenty of exercise. They do best with a large yard and frequent walks. 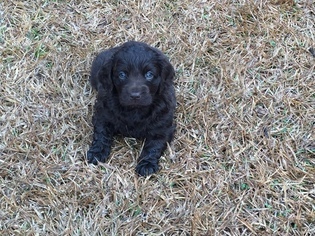 Posted Breed: Boykin Spaniel / Cocker Spaniel (medium coat). Adoption Fee: 300.00.